I am happy to report that half of my gardens are ready for planting! I worked hard this week, and I’m pleased with my progress. First, I had “winterized” them by covering them with plastic. I hoped this would prevent the snow from leeching all the nutrients out of the soil. I drained the irrigation lines, and left them set up–so the plastic was to protect that as well. I removed the plastic, let it dry and folded it up. Next, I took a pitch fork and turned all the soil over. I find that the soil compacts, especially when it gets lots of snow on it. They look really empty, but after a good turning they look more like 2/3 to 3/4 full. Finally, I got some compost, filled the beds, then turned the soil again, mixing the compost in thoroughly. I lay the grids and irrigation lines back down, did a few minor repairs, and I was ready to plant! 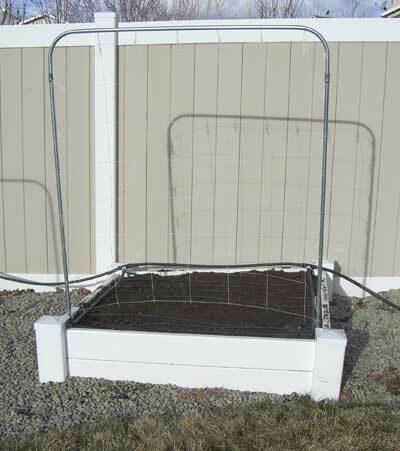 This garden bed has peas planted right under the trellis. I did 2 squares of snow peas and 2 squares of snap peas. 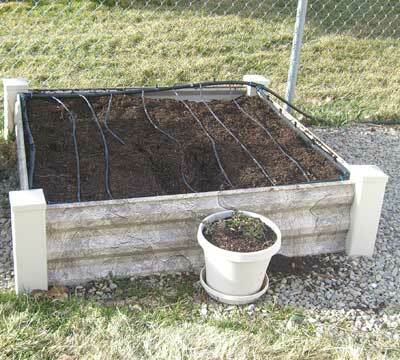 This garden bed has 12 squares of onions–8 of yellow onions, and 4 of red onions. I alternated 4 in one square, then 9 in the next, 4, then 9. You can plant either amount, and I’m always experimenting to see which works best. I used onion sets I bought at Wal-Mart. I should note that although my irrigation lines are set up, I have not turned on the water yet. It’s still raining and snowing and freezing in my area, so I don’t want to burst any pipes or hoses. For now I am watering with a nice spray nozzle on my hose. This garden bed is ready, but not yet planted. It’s my deepest bed (14″) and so I’m going to grow a whole box of potatoes! It’s still a little early for potatoes, so I’ll wait a few weeks to plant them. You can see in the pot–last year I planted oregano and thyme from seed in this garden. At the end of the summer I FINALLY had reasonably sized plants. I left them in the ground to see what they would do, and they survived! So, I’ve decided to move them into pots. That’s why there’s a little soil missing from this bed. That’s 3 down, and 3 to go! One thing I’ve done with my garden plan is to try to plant all my spring (hardy and semi-hardy) plants in these beds so that I only have to prep half of them at a time. For me it breaks things into manageable chunks–especially when the weather is unpredictable and I often only have one nice day to work outside. My garden is doing well except for squash. I have followed Mel B.’s instructions to the letter, but I do not think 4-5 inches of soil is deep enough for squash. I wish I had built my box deeper to accomodate watermelons, and canteloupes, also. I also would like to know specifically what shade material to put over my plants this summer in this hot Texas sun. This is on my list of things to write about. Since bad weather CONTINUES to be a problem, I’ll bump this to the top of my list! I’ve been reading through your site and have collected a lot of good information for gardening. My wife and I are just starting our first garden in our new place this year and I want to be as informed as possible to make the season successful! Us (like yourself) are exposed to crazy spring weather (Aurora, CO), and I wanted your opinion on how to protect plants. I hadn’t seen any page that directly talked about this, but seeing as you also get late snow falls or small hail, what is the best way (or any at all) to protect tender plants? This morning we had 1/2″ of snow on the ground after a few days of 70/80 degree weather. I rushed outside to place some towels on the tomato cages, and cardboard boxes over the peppers. Was this the right thing to do? Each plant has a suggested plant spacing–the back of the seed packet tells you this. In traditional gardening you have plant spacing, and row spacing. 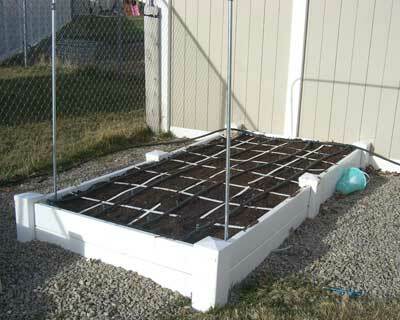 For square foot gardening, ignore the row spacing (this method eliminates the rows) and just follow the plant spacing. Follow the links here to see what they are for each vegetable. Hey, your beds looks great! 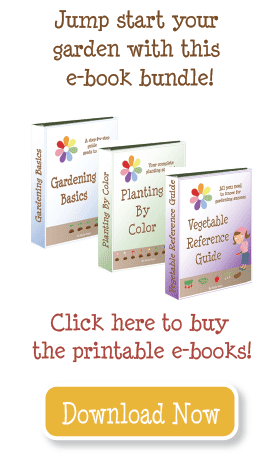 I just turned mine a few days ago and planted sugar snap peas, onions, and carrots in with some help from your planting guide. Thanks for the great posts. I was looking at the # of plants per square. I am confused as to why I should only plant 1 parsley plant per square but plant 6-9 onions per square? I am sure I am confusing something and I am hoping you can straighten me out. It looks great! Happy gardening!